As a licensed esthetician, I always end my sessions with home-care and post-care recommendations. I am sure my clients think I am a broken record, but I just can't help myself. The truth is what happens after your facial is just as important as what happens during your facial. Bottom line, during most facials the skin's pH is being altered, exfoliation treatments are performed and extractions open up the skin. Pillowcases are a factor when it comes to keeping your skin pristine and blemish free. Oftentimes, we do not think about how they can impact the skin but they certainly do. Think about it, we lie on our pillows for about eight hours every night while perspiring, (maybe) drooling and lying on our hair, hair oils and product residue. Pillowcases are a breeding ground for bacteria and need to be changed often if you are breakout-prone. After a facial, it is crucial to replace your 'case so that you don't expose your freshly exfoliated and somewhat vulnerable skin to bacteria and grime. We are all glued to our phones, I get it. But keep in mind that all that texting and scrolling with unwashed hands creates a buildup of bacteria and filth on your screen that ends up close to your cheeks and jawline when you speak on your phone. The last thing you need close to your skin after a facial is the universe of microbes, ketchup residue and who-the-heck-knows-what-else that is sitting on your screen. I joke with my clients that mobile-phone acne does exist — be aware of what is touching your face! Wipe your phone regularly with some type of antibacterial wipe or cleaner so you can prevent this common form of cross-contamination. Keep in mind that communal office phones need the same treatment if you use those regularly, as well. I've never admitted this before, but I always die a little bit inside when my client hops off the spa table after a facial and says, "I am off to the salon to get my hair done now." I know, I know — take a chill pill, Liz — but hear me out. Hands down, it is much better to get your hair done after a facial than before because we all know facials can really screw up your hair. But please also be aware that shampoo and conditioner running down your face, hair dye on the hairline or a keratin treatment near your freshly exfoliated skin is also not an excellent idea. Most hair care products have a pH that is not suitable for the skin and lipids that can clog the skin. 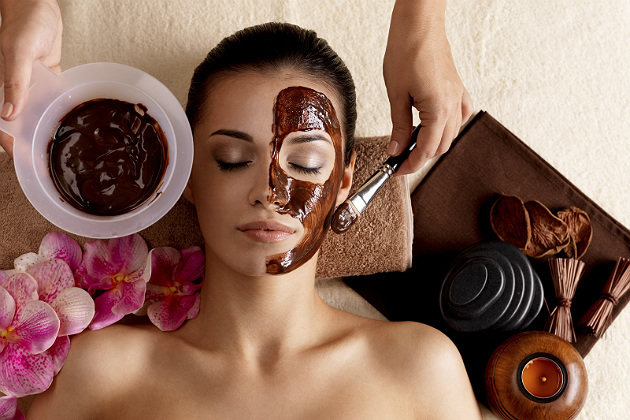 Try to give your skin about 48 hours to recuperate after a facial before you hit the salon. At home, be careful of hairsprays, gels or foams contacting your hairline, as well. Another service you will want to skip about a week or more after your facial is waxing your brows or anywhere else on the face. After a professional spa exfoliation, the skin has been stripped of its outermost layer (the stratum corneum) and will be more fragile and prone to irritation — or worse, even lifting of the skin. If you have ever had brow or upper lip wax that left you red, oozing and scabbed, it is most likely that your skin was lifted from the service. The takeaway here: Waxing is in itself a form of exfoliation, so it is something you do not want to overdo. Take care of your brows, upper lip or wherever else you wax about two weeks before or after your facial for optimal results. Plan your appointments accordingly and get into that routine with your esthetician. Just like pillowcases, towels that we use to dry off our face and body after washing our faces and bathing need to be changed after your facial. Most people don't pay attention, but towels that are left to dry on crowded bathroom hooks on the back of your door never completely dry and are exposed to a lot of bacteria in the bathroom (think open flushing toilets). Make it a habit to change your towels when you get home from the spa so you don't expose your freshly exfoliated skin to unnecessary amounts of mildew and bacteria. Most of my clients squirm a little bit when I ask them when they last cleaned their makeup brushes. I know, life can get busy, but keep in mind that these are tools we use daily, and they can acquire a lot of build-up. Makeup residue, oils from the skin and bacteria can all grow on your makeup brushes and contaminate your skin. I recommend that post-facial makeup tools be freshly cleaned or replaced. For my acne clients, I recommend a new disposable wedge for foundation for every application and that brushes be shampooed 1-2 times weekly. Makeup brushes are best shampooed at night, rinsed well, reformed and left out on a clean towel to dry — they will be ready to use by the morning. Cleaning your makeup brushes the night before your facial is a great beauty ritual to add to your routine. My clients either get slightly annoyed or happily submit when I tell them this one. Yes, you heard it right here: Getting a facial is your get-out-of-the-gym-free card for the rest of the day. Here's why: It's not a good idea to heat up the skin and perspire heavily right after a facial. Think about it: You've just paid over $100 to have your skin exfoliated, deeply cleaned, massaged and infused with nutritive serums — so keep them in there. Not to mention that gyms are not exactly sterile environments. I cringe at the thought of my client doing a downward dog on a dirty yoga mat or wiping her skin with a rough gym towel, after I've just performed a chemical peel. Another good tip is to avoid saunas, steam rooms and swimming pools, for the same reasons. Enjoy the fact that the remaining part of your day after a facial is time to take it easy and chill out — not run 45 minutes on the treadmill or play competitive tennis in the hot sun. Hit the gym before your facial — there is usually no problem doing that. Following these helpful tips are just the beginning to maximizing your professional skin care services and avoiding sabotaging your facial. Obviously, wearing your physical sunblock daily, avoiding excessively touching or picking at your skin and consistently using professional grade products are par for the skin care course. It is easy to keep your skin glowing and healthy with just a few, simple tweaks to your spa-loving lifestyle.